The fourth-generation BMW M3 hardtop convertible is one sweet ride. Racecar looks, a powerful V8 engine, seven-speed double-clutch automatic transmission, race-bred independent suspension, incredible stopping power, a luxurious and ergonomic interior with the ability to drive the car in all types of weather situations. With a bright sky it is time for the sun on your face and the wind racing through your hair. 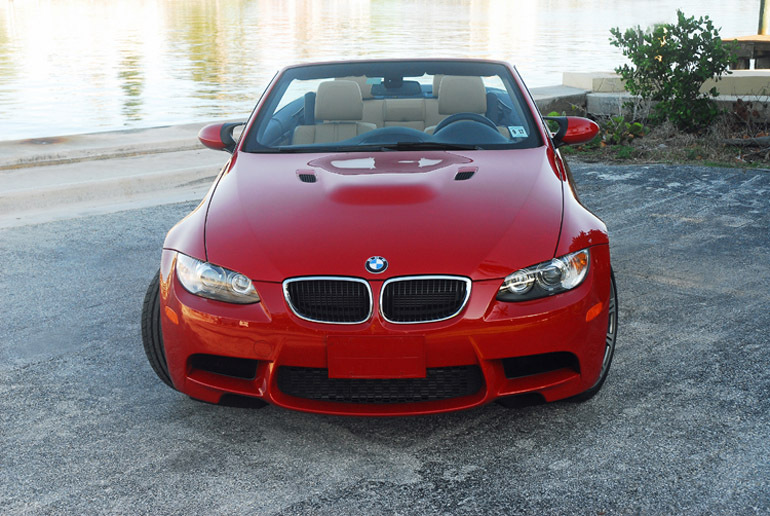 Front to back, the design of the 2013 BMW M3 hardtop convertible shows its sporting character with structural rigidity at the lightest most efficient weight thanks to the use of the most modern components and computer-aided design. The front fascia is signature BMW with the double-kidney grille with chrome surround, and the flat headlight units with standard Xenon headlamps and halo daytime running lamps. Three large air intakes below the grill include two side intakes to keep the brakes as cool as possible during time at the racetrack putting the car through its paces. 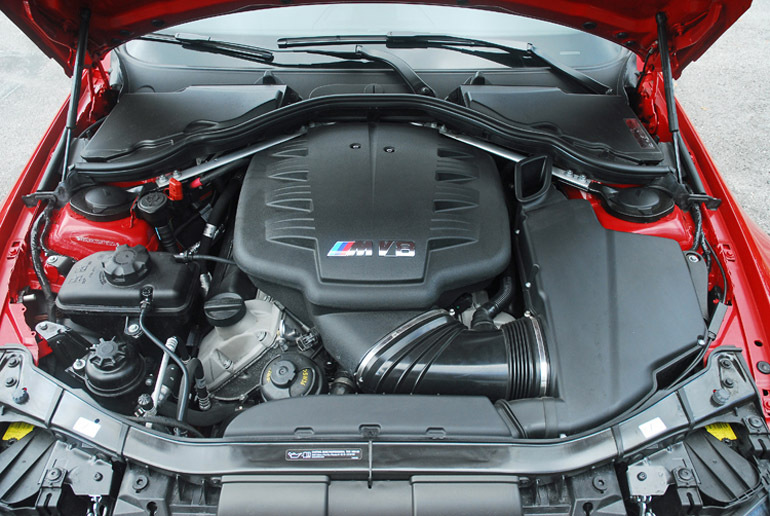 Since the structure and configuration is determined to primarily feed air into the engine compartment, the BWM M3, like all M-cars, forgoes foglamps. The hood features a power dome bump-flanked by an air intake on each side-in the middle of the hood which, though longer, thanks to its aluminum composition also is lighter. The two flared front fenders feature side gills which incorporate the tri-color M logo. The power-remote/power-folding/heated/self-dimming sideview mirrors are aerodynamically designed with an open space between the mirror and the body, letting air freely pass through reducing air resistance. Further down the side-line the pronounced side-sills give the M3 a light and sporting look. Deep side extensions are sculpted to enhance stability a high speeds. A full perimeter chrome strip adds a bit of elegance to the side styling. The new M3 looks muscular from behind and reflects the looks of the front end. A lip spoiler on the trunklid optimizes the car’s streamlining and reduces lift on the rear axle. In its contours, the split diffuser beneath the rear bumper takes up the shape of the air intakes at the front end as the air is guided and the dual exhaust tailpipes move towards the centerline of the car, visually contracting the rear end at the lower center point. The circular shape of the chrome four straight tailpipes is typical BMW M style. 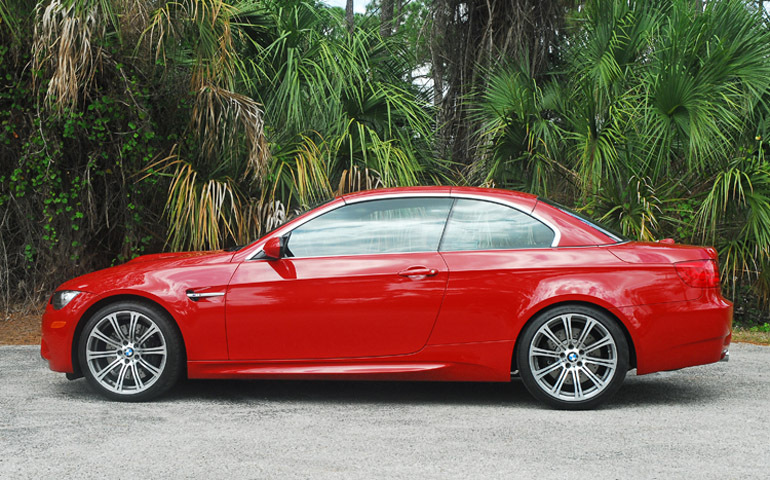 My stunning 2013 BMW M3 was painted Melbourne Red and turned eyes at me and the car wherever I traveled and parked the car. Power to quickly move the M3 comes from the race-bred 4.0 liter V8 engine that generates 414hp at 8,300 rpm and 295 lb.ft. of torque at 3,900 rpm with 85% of the maximum torque available consistently through 6,500rpm. The potent small V8 engine features the company’s variable double-VANOS camshaft management. Offering extremely fast and responsive valve timing, the technology reduces charge cycle losses and improves the output, torque and response of the engine to my inputs while reducing emissions and increasing fuel economy. A separate throttle butterfly for each cylinder-eight-is a feature adapted from BMW’s M’s racing heritage and provides immediate reaction to the gas pedal at all times. Two steeper motors operate the four throttle butterflies on each row of cylinders, giving the engine a particularly sensitive response at low speeds together with an immediate reaction whenever I pressed down the throttle pedal for extra power and performance. A volume flow-controlled, pendulum-slide cell pump supplies the engine with lubricating oil, delivering the quantity required by the engine. Wet sump oil lubrication, optimized for dynamic performance, ensures consistent oil supply to the high-rpm engine at all times, particularly in extreme braking maneuvers. The system features two oil sumps-a small oil sump in front of the front axle subframe and a large oil sump behind it. A new comprehensive electronic engine management system coordinates all engine functions with optimum efficiency and maximizes operating integration with the clutch, gearbox, steering and brakes. Also, the engine control unit performs a wide range of on-board diagnosis functions and masterminds the ancillary engine units. Increased performance with better fuel economy comes from the lightweight engine. At 445 pounds, it is 7% or 33 pounds lighter than the previous inline 6-cylinder engine. Lightweight components do not stop with the alloy engine block. The crankcase is made of special aluminum-silicone alloy eliminating the need for cylinder liners. Despite the need to resist high combustion pressures and engine speeds-this is the ‘fastest’ production engine ever produced by BMW as it can reach 8,400rpm-the engineers managed to keep the compact and rigid crankcase weight down to 44 pounds. A close-ratio six-speed manual gearbox is standard but I was lucky to have the optional M double clutch seven-speed transmission with Drivelogic specially designed for the high-rpm engine which was a thrill to operate. The M double clutch transmission with Drivelogic (M DCT Drivelogic) shifts gears without the slightest interruption in the flow of power. You’ll feel the power seamlessly from first through seven gears. The process of shifting gears is basically the same as on BMW’s proven Sequential M Gearbox, meaning that even when shifting gear manually there is no need for a clutch pedal and I could keep the throttle on the floor during the shift process. The Drivelogic control offers 11 different shift programs to suit your every need. Drivelogic offers 5 programs that allow for automatic operation of the transmission as well as 6 manual programs. Manual operation can be performed via a new sports shift lever or via paddle shifter on the steering wheel. M DCT Drivelogic is amazing to use and is a $2,900.00 option but well worth it if you want the best that BMW M has to offer for thrilling driving. You can set the different programs via the iDrive controller located on the center console. BMW’s new automatic Start/Stop system is fitted as standard equipment. This system saves fuel in heavy stop-and-go traffic situations. When the car is stopped for 3 seconds, the engine is instantly stopped. All accessories continue operating. When I lifted my foot off of the brake pedal or moved the steering wheel the engine restarts instantly. The system can be shut off by pushing a console mounted push button. Getting all of the power to high-performance handling capability on the road or track is the M3’s fantastic aluminum chassis developed specifically for the M3. First off is the great 47.2/52.8% front/rear weight distribution to give the car a very neutral feel. Almost all of the front-end components are aluminum, including the front struts, swivel bearings, central subframe and an additional thrust panel below the engine serving to maximize lateral stiffness of the entire front end. You’ll also find an aluminum two-piece strut tower brace at the back end of the engine further increasing rigidity when turning sharply. From the rear subframe through the transverse arms and track arms to the wheel mounts reconfigured in their kinematics and stiffness, to the mounting points for the longitudinal arms and the aluminum shock absorbers, virtually every detail on the five-arm rear suspension is made of aluminum and is new for the M3. These weight-reduction measures help reduce weight by approximately 5.5 pounds when compared to the previous M3. Both front and rear axles feature hollow anti-roll bars optimized for their function and weight. Incorporating two additional longitudinal reinforcement bars, axle kinematics are perfectly tailored to the overall character of the car. 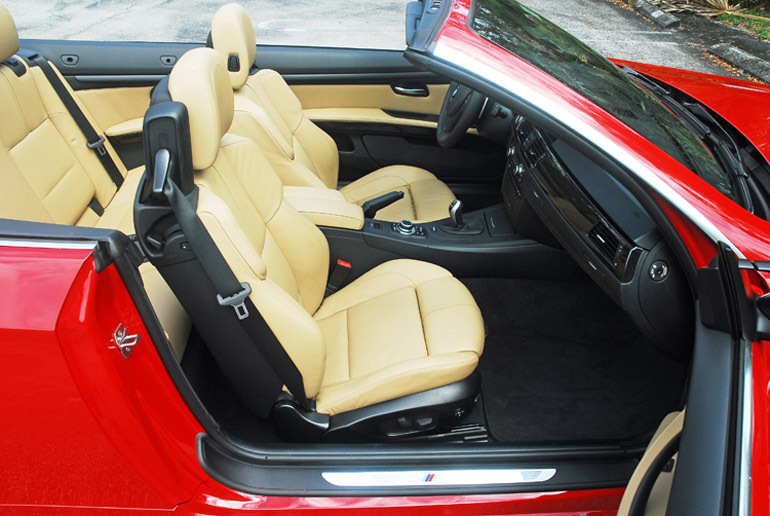 The result, in terms of both stability and weight, conforms to the balanced performance concept of the M3 convertible. With BMW’s Servotronic power-assisted rack & pinion steering you feel like you are piloting a super-high-performing touring racecar. It just goes where you point it to go with little effort and pinpoint accuracy. The rear-wheel drive keeps the rack & pinion steering free of drive forces. The hydraulic Servotronic power assist controls steering forces as a function of road speed. When M-Drive is ordered, there is also a choice of two different control maps activated through the M-Drive programming menu. In Sport mode the M3 provides direct and immediate response with a relatively high steering effort. In the Normal mode, power assistance is comfort-oriented are requires less steering effort. I never felt more confident when driving through curving roads at high speeds. Helping me to feel that confident is the latest generation of Dynamic Stability Control (DSC) which monitors driving conditions and intervenes through the application of brakes and reduced engine power to stabilize the car and help avoid major over-or-under-steer situations. In addition to engine controls and the ABS, other systems integrated in the DSC are All Sean Traction (AST), which prevents the wheels from spinning on surfaces with reduced traction; the Start-Off Assistant, which prevents the car from rolling back when setting off on a grade, as well as Cornering Brake Control (CBC), which prevents the car from spinning or swerving out of control when applying the brakes in a curve. The latest version of DSC includes additional functions for even greater driving safety. Whenever you are likely to apply the brakes in full within the next few seconds, the system builds up pressure in the hydraulic brake circuit and pre-loads the brake pads to ensure an immediate response. The Brake Drying feature removes water film from the discs in wet conditions, this reducing the chance of water interfering with the initial braking process. Furthermore, the optional M-Drive personalizes the driving characteristics of the new M3. The steering wheel mounted Power button changes the throttle response from either comfort to direct/sporting, the DSC button may be switched off and will return when you re-start the engine. The EDC button (optional) is adjustable offering Sport/Normal and Comfort modes. The M-Drive button made its first appearance on the M5 and includes the M Dynamic mode function for the DSC system that allows for some wheel slip for very active driving while still maintaining much of the benefit of DSC and the selection of two different control maps (Sport/Normal) for the Servotronic steering activated through the M-Drive programming menu. In Sport mode the M3 provides direct and immediate response with a relatively high steering effort. With all of this ‘go-fast’ with control parameters, strong and sure footed brakes are of paramount importance and BMW doesn’t disappoint. 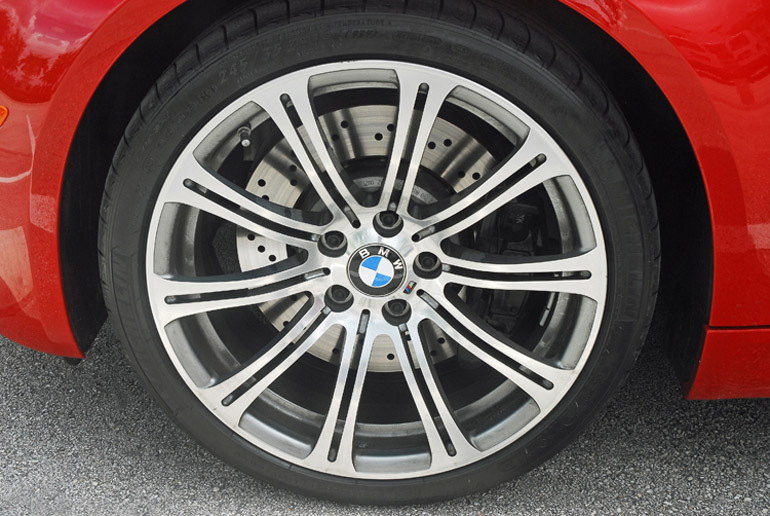 The internally-vented, cross-drilled cast iron discs measure 14.2 inches up front clamped with six-piston calipers and 13.8 inches in the rear clamped with dual-piston calipers. The feel during regular or hard braking is very linear knowing how much pressure to apply to safely stop. The new BMW M3 rides on M-style light-alloy spoked wheels. Standard are 18 inch wheels but my M3 came with the optional 19X8.5 inch front and 19X9.5 inch rear wheels. These beautiful wheels were wrapped with Michelin 245/35ZR19 front and 265/35ZR19 inch Pilot Sport high-performance, low profile tires for fantastic grip and a smooth quiet ride. The interior mirrors the high power and performance under the skin with a very racecar oriented yet very comfortable and luxurious interior. Surrounded in the finest leathers and powerful contours and flowing lines highlighted in particular with concave and convex surfaces. The horizontal lines dominating the area around the dashboard as well as the harmonious surfaces on the side linings give the interior a more dynamic look. 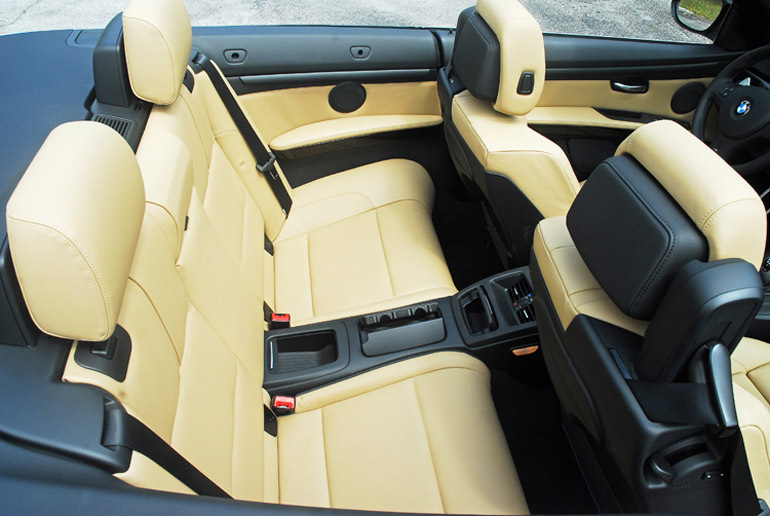 Adding luxury to the interior is the dark wood found on the dashboard and doors. The cockpit control area tapers out between the front bucket seats with lumbar/side bolster, height and reach adjustments, into a newly designed center console which discreetly ‘swings’ towards you. The controls, buttons, dials are all ergonomically placed for easy reach and use. 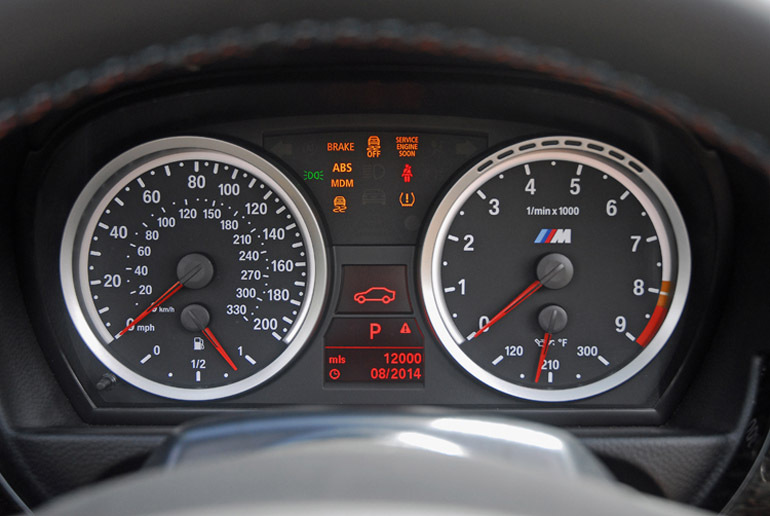 The unique nature of the M3 carries to the dash where the dual circular instruments typical of BMW-the speedometer and fuel gauge as well as the tachometer and oil temperature display-are in specific M style. 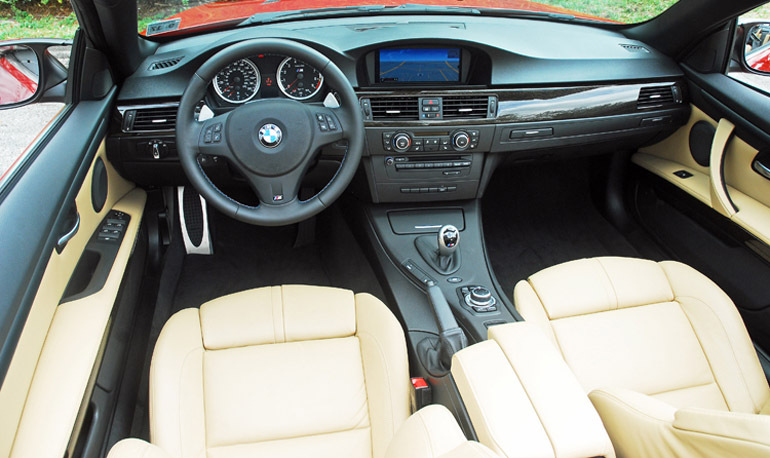 The M3’s leather-wrapped/tilt/telescopic steering wheel feels perfect in your hands. The spokes within the wheel incorporate the remote control buttons for the audio system, and mobile phone, as well as the optional M-Drive button. A premium AM-FM-CD player audio system comes standard with an auxiliary input jack. Individual entertainment options include Sirius satellite radio, HD radio and a USB enabled port for control of an Apple iPod or iPhone media player. The Navigation system’s 8.8 inch color screen is clearly seen with a hood to keep the sun’s glare to a minimum. The 4th generation IDrive system is found on the center console and is more simple and intuitive to use. I liked how well it anticipated my next moves and needs. Standard equipment not mentioned above includes express up/down windows, one touch hardtop convertible control button on the center console, rain-sensing wipers, cruise control, dual map lights, dual storage pockets in each door, deep glove box, dual lighted vanity mirrors, and floor mats front and rear. Standard safety systems include the rigid body structure, front/rear crush zones, steel beams in each door, four-3-point safety belts with front pretensioners/load limiters, driver/front passenger airbags in front and at the sides, side curtain airbags for the front and rear, and a rollover sensor with quickly activated roll bars that rise behind the headrests. 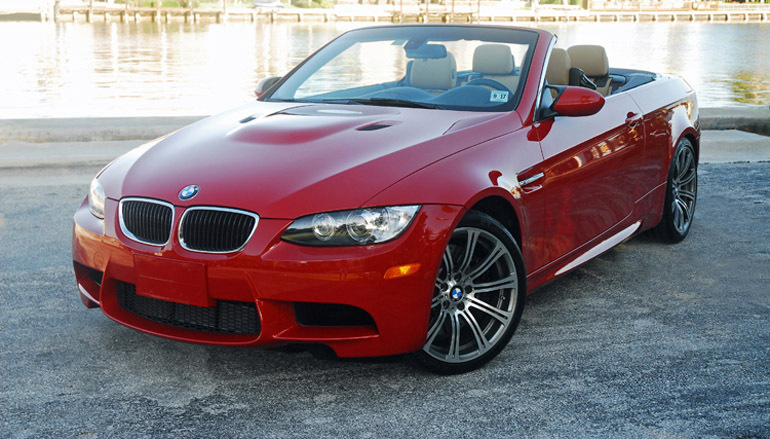 The new 2013 BMW M3 hardtop convertible is awesome in every respect for a compact two door super coupe. It has the racy looks, the high-performance attributes needed to back it up plus the most comfortable, modern and safe cabins in the segment. Take a test drive and hold on tight!